There are a lot of systems in place that put our cars in motion, but often times we do not know how they work. Especially the Electronic Throttle Control system. Have you ever had an issue with your vehicle engine when the speedometer idles? And you suddenly can’t accelerate over 30mph? Maybe this hasn’t happened to you, but you can sympathize with those folks in the slow lane with their hazard lights on. Whatever the case may be, those slow drivers are more than likely dealing with an Electronic Throttle Control problem. 1 What is Electronic Throttle Control? 2 Why do we have the Electronic Throttle Control system? 3 How does Electronic Throttle Control Work? 4 What are the benefits of Electronic Throttle Control? 5 What causes the Electronic Throttle Control system to fail? 6 What should I do if the Electronic Throttle Control light turns on? Every driver follows the same steps of inserting the key, turning the ignition, putting the car into gear, and pressing on the pedal. But did you know about the system in place that actually tells your vehicle it is time to go and just how fast to go? The Electronic Throttle Control system is the inner workers of the engine that signals the throttle when the pedal is pushed. The Electronic Throttle Control system within most vehicles is constructed with three important parts: the accelerator pedal, the throttle valve, and a control module or PCM. There is no direct cable that connects the pedal to the throttle of your vehicle. So often times this technology is called Drive by the Wire. Electronic Throttle Body Assembly for Colorado Impala Trailblazer Envoy Canyon. Why do we have the Electronic Throttle Control system? Before the Electronic Throttle Control System was introduced in 1988, the pedal of a vehicle connected to the throttle via a cable. Now, instead of a mechanical link between the pedal and throttle, BMW introduces the concept of Drive by the Wire. The sophisticated design is set up with electronic control modules, sensors, and actuators that communicate wirelessly. Since the introduction of the Electronic Throttle Control, driving is smoother with less feel from transmission movements. How does Electronic Throttle Control Work? So you might be asking, if there is no direct cable between the pedal and the throttle: How does the system work? Instead, sensors send electric signals to determine the pedal position. If you have your foot pressed against the pedal, the sensors measure how far the pedal is from its original position. Then they send the information to the engine management system. From there, the engine management system sends this new information to the motor which adjusts the position of the throttle. The throttle can open and close according to the instructions from the electric motor. Sensors in the throttle called the throttle position sensors (TPS) will then communicate with the engine management system to let it know it is in the correct position. 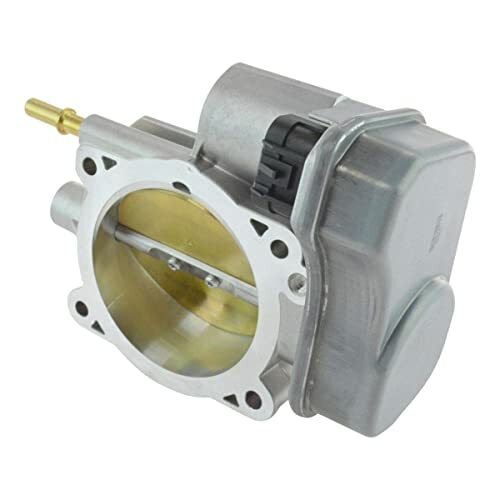 At the core, the throttle body controls the amount of air that flows into the engine. I.e., the amount of air that is allowed inside is indicated by how far the driver has pressed the pedal. If the driver is pressing down on the pedal, the throttle position sensor receives a signal that indicates where your foot is. With constant updates about the throttle position, the computer signals how much fuel is necessary to inject into the system. With both the proper amount of air and fuel sent to the engine, the engine can, in turn, perform smoothly. What are the benefits of Electronic Throttle Control? Without cables or mechanical parts in the way, the information from the pedal will transmit with ease to the computer system in the car. Therefore, eliminating the cable and replacing it with electronic sensors, reduces the moving-parts and eliminates engine wear-down and maintenance. Additionally, if the vehicles onboard electronic system communicate properly, the computer can control all of the engine’s operations. Most importantly, for the safety of the driver, with actuators and sensors in place, the engine receives the correct information from the throttle opening. With clear and accurate readings from the ETC, the vehicle is easier to operate and the drivability improves a lot. What causes the Electronic Throttle Control system to fail? As previously stated, in order for everything to run smoothly, there needs to be a perfect ratio of air and fuel flowing into the engine. If any disruption of this ratio, a problem may occur within the throttle body. There are a few reasons that a problem may occur within the Electronic Throttle Control System. On the interior of your vehicle’s engine, dirt may build that can obstruct the airflow or fuel flow to the engine. If there is dirt or grime, an uneven or rough surface may appear in the throttle body, which in turn can disrupt the flow. Electronic problems can cause for inaccurate or a misread of information transmiting to the vehicle’s computer. If this occurs, the throttle body may have an issue receiving clear information from the sensors in the accelerator pedal. A Vacuum Leak is another potential problem within the ETC. If there is a leak, there will also be a disruption of airflow. Which may cause problems for the throttle system. An indicator of a vacuum leak may be a high engine idle, which is caused by too much air. In this event, the systems inside your vehicle should illuminate the Check engine light. What should I do if the Electronic Throttle Control light turns on? If your Electronic Throttle Control light becomes illuminated, you should know right away due to the symptoms from your vehicle. Electronic throttle control light is on in your car. Very noticeable changes may occur such as low engine power, stalling engine at stops or idling. To ensure specific safety measures are in place, most often the computer will signal that a problem has occurred instantaneously. The computer of the engine is programmed to go into limp mode. In other words, the engine will not allow for acceleration. Essentially, your engine will manually limit your speed in order to prevent damage to yourself and to the engine. For a driver experiencing this difficulty, we advise to turn off your vehicle engine and check with a mechanic. There are ways to reset the Electronic Throttle Control as well as clean out the throttle body in the event of dirt build-up. If there is a serious problem within the Electronic Throttle Control system, the throttle body may need to be replaced. BONUS: Error code P0420: What does it mean & What to do?